My co-worker lost her beloved dog a few weeks ago. I attempted to make a needle felted dog that would look like her baby. It's so sad to lose a pet. 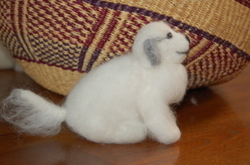 This was the first needle-felted dog I have attempted. I made it completly of wool, with no wire armature. I had this picture that I pulled off her Dogster site. It's kind of a "Myspace" for dogs. I think I captured her essence. What do you think? I think I owe you a better photo of your work. :-) From the front especially, you can clearly see how much work went into recreating Calysto's smile, personality, and markings. 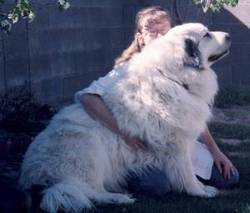 There was no doubt from the moment I saw this that it was not 'a' pyrenees but *my* pyr. Your efforts captured the spirit of a beloved companion in so many ways, from her face to the feel of her fur - it is a rare talent to capture a soul. Thank you!